In her debut novel, Hattrup explores issues of race, class, and sexuality mostly from a distance, through the lens of white, presumably heterosexual Frannie. Frannie’s 17-year-old cousin, Tru, is gay, and Frannie believes he has been sent to stay with her family in Baltimore for the summer as a result of coming out to his parents. Frannie hopes that Tru will be a bright spot in an otherwise miserable summer; she longs for Tru to see her as confident and sophisticated. Because her father is out of work, Frannie has to leave Catholic school to attend a predominantly black public magnet school—but the entire story takes place the summer before Frannie changes schools. During the summer, Frannie befriends some black kids, thanks to Tru, but aside from a couple of awkward scenes, race is mostly dealt with through Frannie’s anxious thoughts. Hattrup captures Frannie’s insecurities and shyness well, but these traits aren’t enough to make her a compelling character. 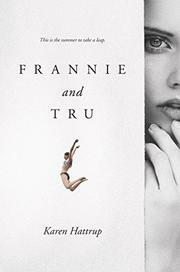 Similarly, Frannie’s relationship with Tru makes for a very thin plot and very little tension. Most of the drama occurs in the last third of the book, and much of that comes across as too-little-too-late or contrived.